…is what you get when you load your SMART Bro Prepaid. With the “Loads of Laptops” promo, SMART Bro subscribers now have a chance to win a brand-new HP 2133 Mini Note laptop every day, every time they buy a minimum of P30 load for their SMART Bro! SMART Bro Prepaid provides pay-as-you-go high-speed Internet access at the affordable rate of only 10 pesos for every 30-minute use. The whole kit now costs only 2,500 pesos and could be used straight out of the box, for speeds of up to 2 mbps. It uses SMART’s nationwide wireless broadband network to connect a desktop or laptop to the web through the use of a USB-type wireless modem. 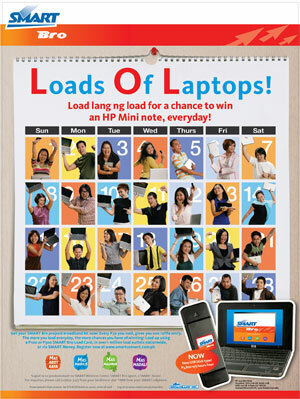 A minimum of 30-peso load entitles a SMART Bro subscriber to a chance to win an HP 2133 Mini Note laptop. Raffle draws will be done weekly with one daily winner until December 13, 2008. Every 60-peso load will entitle a subscriber to two raffle entries, 100-peso load for three entries, 300 for 10 entries; and 500-peso worth of load for 16 raffle entries. To join, subscribers must first activate and register their SMART Bro Prepaid account in SMART Web Connect. Load for SMART Bro Prepaid is available from over a million SMART E-load retailers all over the country, or via the SMART Bro Load 100- or 300-peso card. This page is sponsored by Smart Communications. Please contact Smart directly for any inquiries regarding these promotions as we act as publishers of ads only. merong smart bro ung tga d2.. pero every time n maglalaro xa sa ng online game nddc ung game.. ??? me problema dw po ang smart bro prepaid d2 sa mindoro….